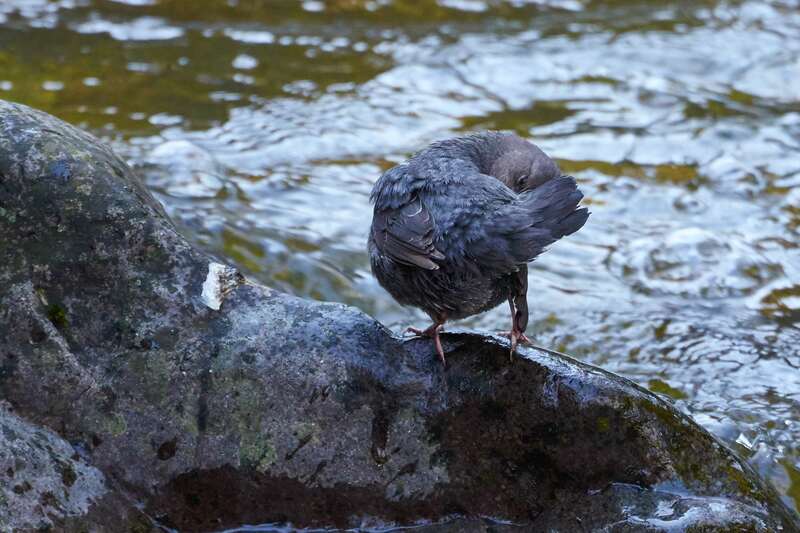 Met at Bluebird Park this morning and watched two dippers working on nest. 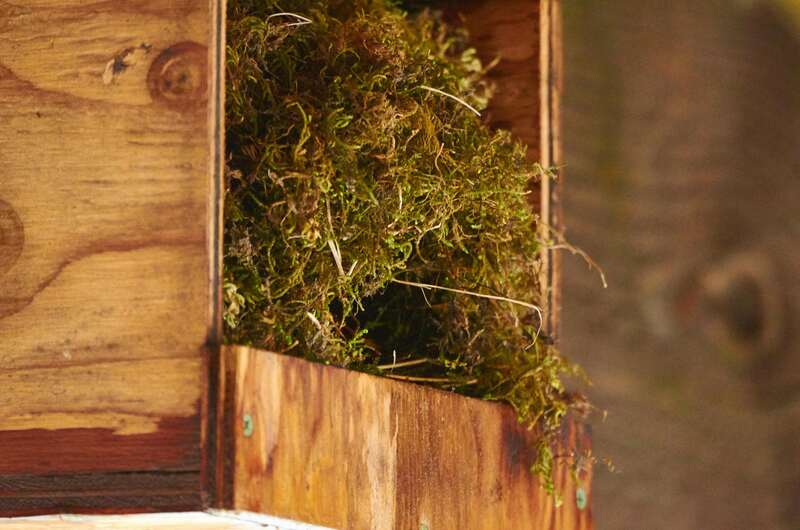 They were using the nest box that is attached to a pipe under the bridge instead of the drainpipe hole they had used in the past. We saw the banded male from 2014 with a new partner. Nest appeared to be 1/2 to 2/3 complete. We saw the female gathering mostly moss but a few time she gathered some twigs and needles. The male was seen gathering moss. We proceeded up to the Granite St. reservoir and saw no birds until we were half way between Bridge 1 and 2. Bird gave a double-noted rattle flight call and flew up stream. We gave chase but did not see the bird again. Then as we approached Bridge 2 we heard another rattle call but did not see the bird or where it came from. So either it was the first bird or a second. At Bridge 3 we encountered the male preening and singing on a rock just up from the bridge. As we were watching the male I glanced up and saw the female exit the nest box under the bridge and head down stream. The male followed. We did not encounter the pair again on our way down. The nest at Bridge 3 appeared nearly complete. We would expect egg laying to start 6-15 days from nest completion. Near Bridge 8 which is the bridge below Pioneer St. we found the banded male from Main St. on a rock singing and preening. We speculated that he was up near the edge of his territory based on the fact that last season he brought his young up all the way up into this area from the Main St. nest. There is good cover here and protection for the fledglings. In the last few years since the nest box was installed at Bridge 3 it seems that the Bridge3 birds edge down to just below the Pioneer St. bridge where they meet the territory of the Main St. birds. We will see if this pattern continues to hold this season. We walked back to Bluebird Park occasionally encountering the male as he made his way back down (who’s monitoring whom). We also saw the female working on the nest. 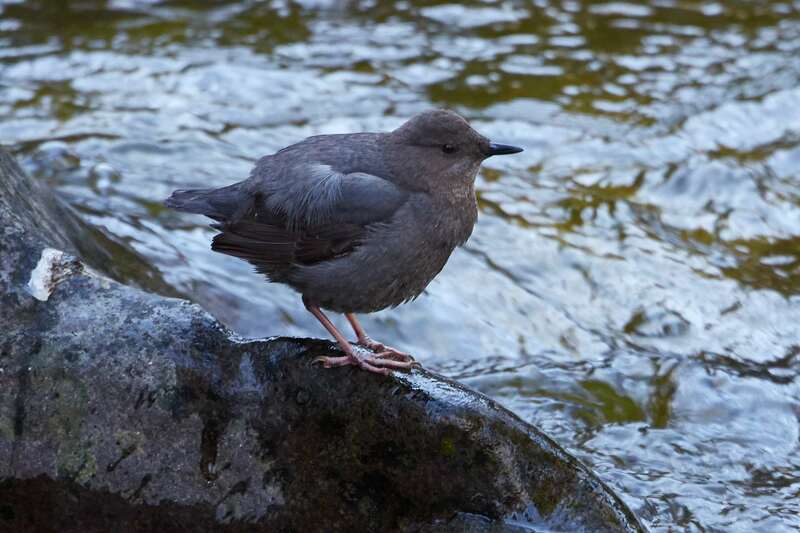 In summary we saw at least 5 different dippers and found two pairs nest building. 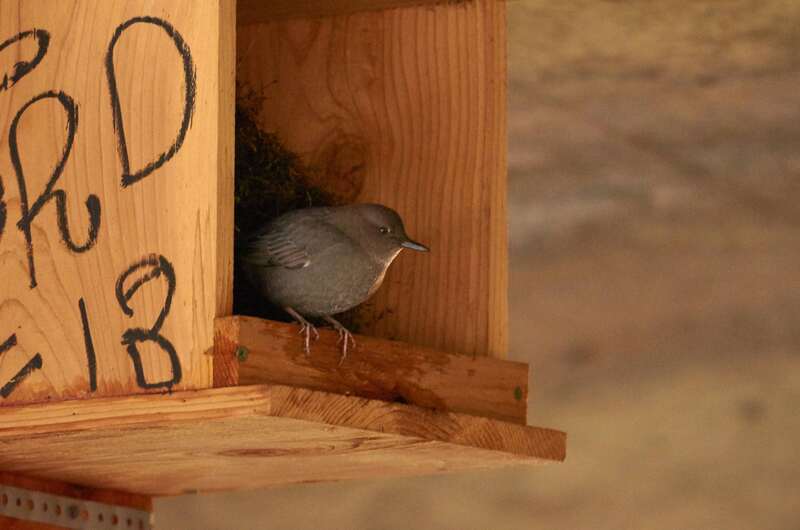 Both pairs were using nest boxes.